That awkward moment when a strange thing falls out of your baby’s pajamas when you go to change him. You know, I think I have it together and I know what I’m doing to care for Wes as he fights the good fight. I may not be able to hold onto any other concepts or problems or facts in my mind right now, but Wes’ care I have down. Until this morning. I went in to do our usual morning routine of starting the day smiling at each other. He is such a happy boy first thing in the morning! All the time really, but I digress. I take him over to the changing table. I unsnap his pajamas (why baby pajamas have about 100 snaps and half snap a different way than the other half, I will never know). And something falls out of his pajamas. I realize within a half a second that it is part of the dressing for his central line – the part called a Biopatch that surrounds his line to keep germs out. I am frozen in place. I don’t know what to do. I don’t even want to look at the dressing because I don’t know what I am going to do. I am here alone, and changing his dressing is definitely a two person job and the nurse usually comes to the house and does it. And if he’s pulled the dressing off, there is a chance he has pulled his line out. Oh boy. I finally work up the courage to look at his dressing. The bandage is hanging on by one corner, and the central line is still in. I throw another bandage on top of the current one and give the on-call pediatric oncologist a call. She asks me a bunch of questions about how the line and dressing looks, and she says we are fine to wait til our already scheduled appointment this afternoon to have it looked at. Whew. What? No, I didn’t panic. I got this. I don’t know what you’re talking about. Panic. Hmph. Me? Never. Now that I have your attention, I thought I would take this opportunity to update everyone on how Wes’ treatment plan is going. He has had two rounds of chemo so far, and his next one is scheduled for 11/8 and 11/9. That 3rd round of chemo has been scheduled as out-patient. This will be our first time doing chemo as an out-patient procedure, so we will see how that goes but I for one am excited about not having to sleep in the uncomfortable hospital recliner all night! He has his next retinal exam under sedation scheduled on 11/15 , and he will probably have cryotherapy on his right eye at that time. 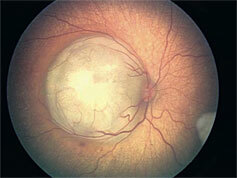 The point of the retinal exam is to see how the tumors are reacting to the chemo, and document it with pictures. When we went for his post-surgery follow-up a couple weeks ago, the doctor offered to show me the pictures of Wes’ eyes from his retinal exams. It was so cool to see! The difference in the size of the tumors from before chemo and after one round was incredible! The tumor in his left eye is right in the center of the eye, wrapped around the optical nerve. Before chemo, it was consuming a little less than half of the eye. After one round of chemo, it is about 1/3 of the size it was before. They don’t want to do any local therapy (cryo or laser) on the left eye for now because the local therapy can damage vision around the tumor. He may or may not recover vision in that eye, but they want to give him a chance. He will go through the 6 rounds of chemo and then the doctors will decide what, if anything, to do from there with that eye. The tumor in his right eye is off to the side, out of his line of vision. He has had one cryotherapy treatment to that tumor, and he tolerated that well. The doctor told me a couple of positive things during that post-surgery appointment. The chance of any new tumors developing, or the pineal gland getting involved, during this 6 months that he is getting chemo is close to zero. And after the chemo, if new tumors do develop in his eyes some time in the next few years, the tumors will probably be on the sides of the eye and not right in his vision. They will be doing monthly retinal exams under sedation, so if there is a new tumor they can catch it early and hopefully do local therapy to address it. So we will focus on all of those good things, and try not to think about the small chance that our path doesn’t go down this road. This picture is not Wes’ eye, but is similar to the pictures I saw of his eyes. In case you are interested. But do not, under any circumstances, google images of retinal blastoma. Not kidding. Angie, Jake & Wes – You all are amazing! We are rooting for you to keep fighting the good fight. I also wanted to send along some cool things in the event that you haven’t seen them by Brene Brown. I think she would be fighting right alongside of you!